In 1999 all schools in the United Kingdom were required to implement an anti-bullying policy, but most research since then has confirmed that levels of school bullying have either remained the same or got worse. Unfortunately bullying by other pupils just won't seem to stop, even when schools try to tackle the problem head on. This often leaves pupils who are being bullied feeling frightened, frustrated and powerless. If you are being bullied by other pupils at school, remember that you always have options for ending this harassment, but first you must take action against your tormentors. What Is Bullying By Other Pupils? Name calling and hurling insults. "Teasing" or consistent comments about height, weight, appearance, possessions, abilities, religion, ethnicity, or sexual orientation. Physical contact including hitting, kicking, punching, pinching, pushing, hair pulling or spitting. Stealing, hiding, defacing or breaking your possessions. Shouting at or about you. Ignoring you and/or singling you out for exclusion from activities. Making sexually suggestive comments to or about you. Making unwanted sexual advances toward you. Sending you insulting or harmful emails, text messages or instant messages. Posting hurtful information, rumours or pictures of you on a website or blog. Putting pressure on you to say or do something with which you are uncomfortable. What are the Effects of Being Bullied by Other Pupils? Frequently be absent from school. Be afraid of, or even change, their route to and from school. Skip certain classes and activities. See a decline in their schoolwork and marks. Require new bags and school supplies often. Lose confidence in themselves and their abilities. Have frequent and unexplained cuts, scrapes and/or bruises. Seem sad and cry more frequently. Seem angry and become violent or have outbursts more frequently. What Can I Do to Stop Bullying By Other Pupils? Ask to see a copy of your school's anti-bullying policy. Read through it and understand how the school should deal with bullying. Record instances of bullying in a diary, including what happened and who was involved. Tell a trusted adult about what is happening. Save proof such as a defaced book, nasty text message or insulting email. Do not reply in online abuse, such as via text messages, emails, instant messages, websites or 'blogs. Try to stay around others. Bullies often begin their activities when their victim is alone. When you feel ready, make a formal complaint to your school. Do not stand up to your bullies alone. This may just bring on further bullying and put you in physical danger. Do not become a bully yourself. Sometimes victims of bullying become so frustrated with the way they are being treated that they take it out on someone else. This just perpetuates a cycle of bullying and hurts more people. Bullying can be a terrible ordeal and sometimes adults don't take it seriously. 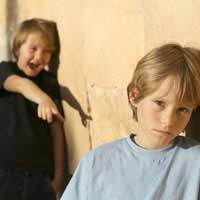 Bullying may be ignored as "boys being boys" or just a little bit of rough play. If you are being bullied and you worry that others may not believe you, keep track of what has happened and any evidence that you can find. Only when others are confronted with a bully's harmful deeds will they understand the full extent of the situation. Good luck! i am getting bullied by someone she is in my class and she is called MILLIE CRAVEN she is horribull to me it is not cyber bullying she bully's me in person. We HAVE TO STOP BULLYING NOW!